If anyone ever thought that singing gospel music was the exclusive preserve of Christians, then the one must have to revise his or her thoughts, for what is about to happen in the next few days, would be mind-boggling. 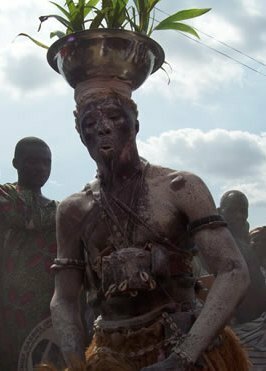 The next latest gospel track to hit the Ghanaian market would have the label of the country’s most dreaded fetish priest and head of the Kofi, Kofi Shrine, Nana Kwaku Bonsam. Gospel music lovers and fans should expect something mega this Christmas festivities and early New Year, because the celebrated fetish priest is coming out with a sensational gospel album, which will soon hit the Ghanaian market. Nana Kwaku Bonsam is currently working to put finishing touches to his eight track gospel album, entitled “Kura Wo Gyidie mu,” which literally means “Hold on to your faith,” an album, which according to him, would set new standards in the country’s gospel music industry. “I am currently working on my album, which I hope to release in this year’s Christmas festivities, that is why I have not been making public appearances these days,” was the answer the fetish priest gave to the paper in an exclusive interview, when he was asked what he had been doing. Some of the hit tracks on the album, which is to come out on the 24th of December, 2009 include “Emu Atem” (Thou shall not Judge), “Nyame Baako Pe” (One God), and “Oma mu Wo Nhyira” (Blessed is the hand that Giveth). Nana Kwaku Bonsam is on the George Forest Record Label, and is expected to reach the gospel music market by the 24th of this month. Asked what motivated a fetish priest like him to go Gospel, Nana Kwaku Bonsam said his decision to compose the gospel music was informed by the increasing spate of false prophets in the country, who claim to possess powers from the Almighty God, adding that the song is expected to enlighten Christians, and expose the activities of these false prophets masquerading as true servants of the Lord. Sounding Biblical, the dreaded fetish priest, who has challenged so many self-acclaimed pastors in the country to an open miracle contest, quoted the Gospel according to St. Mathew in the New Testament of the King James Version, Chapter 13:30, which reads “Let both grow together until the harvest: and in the time of harvest I will say to the reapers, Gather ye together first the tares, and bind them in bundles to burn them: but gather the wheat into my barn.” The renowned fetish priest said he was of the conviction that God, in his own time, would expose the nefarious activities of these so-called fake pastors taking undue advantages of innocent Ghanaians. He said God Almighty, in his own wisdom, had given each and every one a unique talent, which when pursued with determination and steadfastness, would eventually enrich one’s life. He therefore called on Ghanaians not to patronise these fake prophets, and instead follow the right path that leads to eternal bliss and salvation.